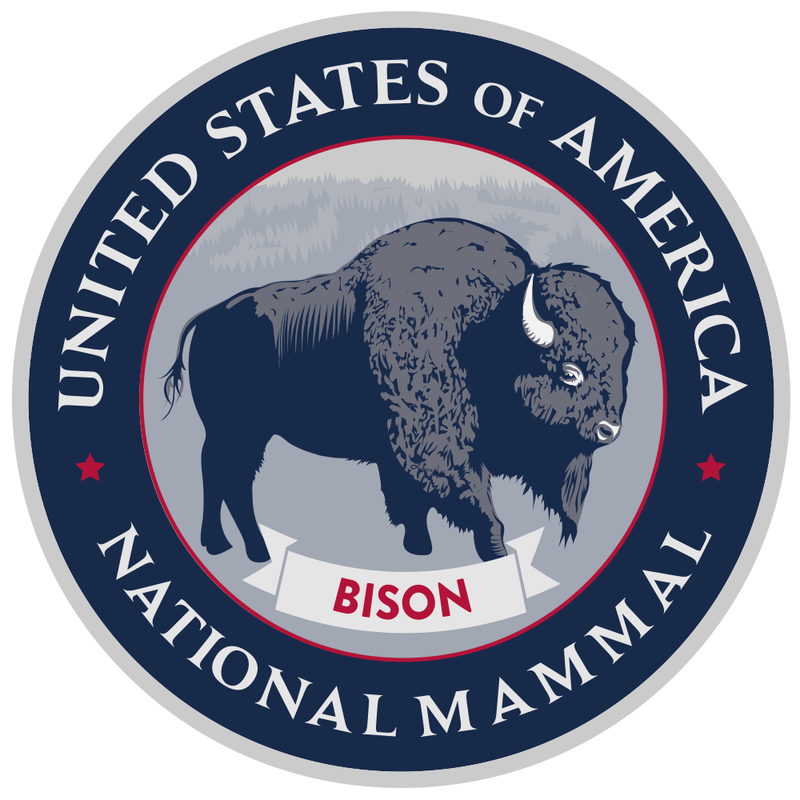 President Obama signed a law on Monday declaring the bison as America’s national mammal. For those bald eagle fans, don’t worry! The bald eagle remains the national animal (and national bird) of the United States. The bison is an excellent choice for the honor of national mammal. Bison once numbered in the millions in the United States. Their range stretched from Canada to Mexico. Many Native American tribes relied heavily on bison as a source of food and clothing, and they considered it of great spiritual significance. When white settlers spread into the Great Plains, they decimated the bison population, and the bison nearly went extinct. 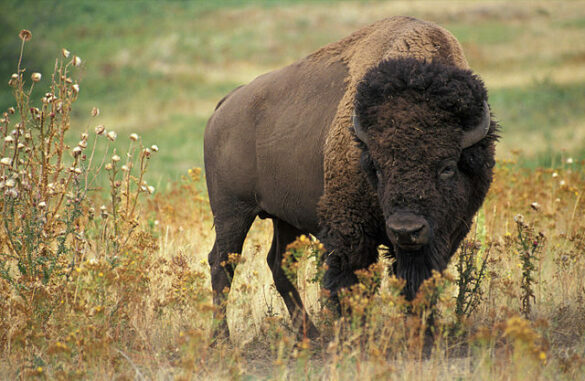 Due to conservationist efforts starting in the early 20th century, the bison was saved from extinction. But they are still classified as Near Threatened by the IUCN. You can help in their preservation by adopting a bison via the Defenders of Wildlife or donating toward the purchase of prairie land for reserves at the American Prairie Foundation. To learn more about bison, see our American bison facts article. In a collaboration between the Blackfeet Nation, Elk Island National Park in Alberta, Canada, Oakland Zoo, and Wildlife Conservation Society (WCS), 88 bison were transferred from Elk Island to the Blackfeet Nation Reservation near Browning, Montana. 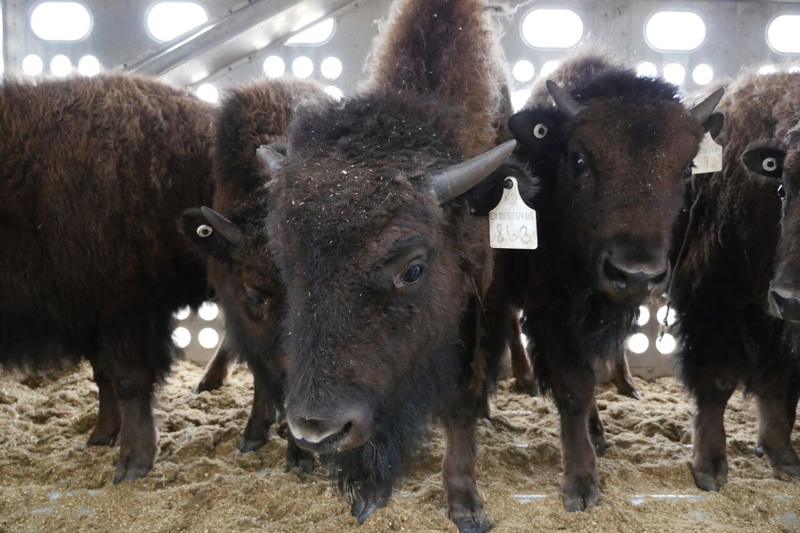 This transfer marks a truly historic occasion for the Blackfeet people, whose cultural identity is strongly wrapped up in the icon of the buffalo (or bison, as they are known scientifically). In 1873, bison from the Blackfoot land were captured and formed the “Pablo-Allard” herd. They were sold to to the Canadian government in the early 1900s. The Elk Island bison are the descendants of that herd. More bison could start to live naturally on the prairie with the American Prairie Reserve’s purchase of 150,000 acres of Montana grassland. The American Prairie Reserve, a non-profit land trust based in Bozeman, Montana, recently purchased a sizable plot of land (150,000 acres) adjacent to the C.M. Russell National Wildlife Refuge. South Ranch, the purchased land, was originally set up as a cattle ranch and is located 60 miles south of the Canadian border. In purchasing the ranch, the American Prairie Reserve has taken one step towards their main goal of creating a wildlife preserve larger than the state of Connecticut. Their goal involves acquiring more land, pulling down the fences that once contained cattle, and allowing the area to return to the natural ecosystem that once existed in that part of the U.S. This means bison, pronghorn antelope, prairie dogs, and their natural predators free flowing through an uninhabited area of prairie land. The bald eagle has been the national emblem of the United States since 1782, when it was adopted as a symbol of freedom and its imagery was incorporated into the Great Seal. Its symbolic status helped people rally around it when it faced extinction in the mid twentieth century due to human encroachment and the pesticide DDT. In recent years, the bald eagle population has recovered, and it was taken off the endangered species list in 2007. Similar to the role of national bird, Senator Mike Enzi (R) of Wyoming and Senator Tim Johnson (D) of South Dakota introduced a bill that would recognize the bison as America’s national mammal. Vast herds of American bison once roamed from Canada to Mexico. From a population that numbered in the millions, American bison dwindled to near extinction by the 1880s, driven there by American settlers. Today, bison populations have started to recover. There are about half a million bison living today. However most of the bison live in commercial herds and carry genes from cattle. Only a few thousand bison are pure descendants of the vast herds that dominated the Great Plains centuries ago. To urge your senator to co-sponsor the National Bison Legacy Act, which will help preserve this great species and honor it for its significant role in American history, visit Vote Bison and sign the petition. To learn more about bison, see Animal Fact Guide’s article, American Bison. At a national conference held in Rapid City, South Dakota, the Wildlife Conservation Society released a survey regarding how people view the American bison. According to the results, most of the people surveyed value the herd animal as a national symbol. However, less than 10% of those surveyed understood the status of the bison population in North America today. Before European settlers came to the New World, the American bison numbered at around 30 million, and their range stretched all the way from Alaska to Mexico. Today, only 16,000 bison freely roam in North America. The Wildlife Conservation Society hopes to promote the restoration of bison populations by appealing to government agencies, conservation groups, and ranchers. Ecological restoration of the American bison would mean that large herds could roam freely within their historic range and interact with other native species. 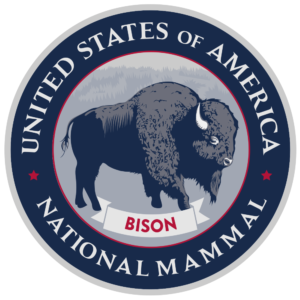 For more information about the American bison, their conservation status, and what you can do to help the bison, view Animal Fact Guide’s American bison article.